Mike Connors in The Many Deaths of Saint Christopher, a first-season Mannix episode. This week’s death of Mannix star Mike Connors spurred the blog to take a look at some spy-related episodes of the private eye drama. Mannix mostly mixed it up with hoods and other crooks. But, on occasion, there were espionage-related stories. The Many Deaths of Saint Christopher (first season): Intertect, the large detective agency Mannix works for in the first season, is hired by Germans representing a European industrial concern. They’re after a missing scientist. Mannix doubts the motives of the agency’s clients — with good reason, it turns out. The reality is there are a group of Nazis from World War II and Nazi hunters. Mannix is in the middle and has to figure out who is who. Deadfall (first season): A two-part story involving industrial espionage. Vancom Industries is developing an advanced laser. It has hired Intertect to provide security. A Vancom lab technician is killed in an explosion caused by sabotage and the lead Intertect operative apparently has been killed in an auto accident. Vancom rival Berwyn Electronics demonstrates its own version of the device. The laser only fires at a target spot and won’t fire if blocked from the target by a human being. Mannix picks up the trail. The question is whether the Intertect operative was involved with the sabotage and who at Vacom participated in the theft of the system. Meanwhile, Intertect chief Lew Wickersham (Joseph Campanella) is behaving erratically as the result of a medical prescription. Toward the end of Part I, Wickersham explodes in rage at Mannix and fights the detective viciously. Mannix must not only solve the case but find out the reason for Wichersham’s behavior. To the Swiftest, Death (second season): Mannix is participating in an amateur auto race. One of the race cars is involved in a fiery crash, apparently killing the driver. 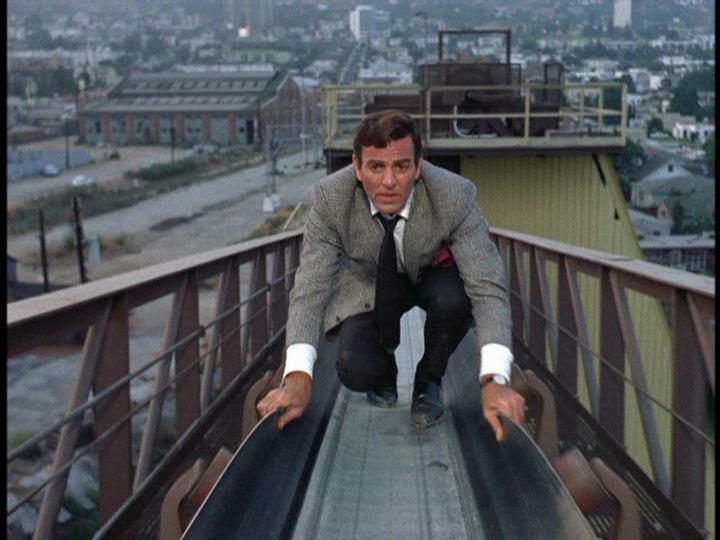 Mannix is hired to investigate the crash. But U.S. authorities are taking an unusual interest in the case. Race Against Time (seventh season): The first two-part story since the first season of the series. Mannix is recruited by the U.S. government. Mannix knows Victor Lucas, who is leading a resistance movement inside a repressive country. Mannix recruits a famed heart surgeon (John Colicos) and smuggles him into the country. Mannix and the doctor meet up with members of the resistance movement. Before the doctor can perform the surgery, the pacemaker that Mannix brought with him has been smashed. Mannix must now find another suitable pacemaker and find out who the traitor is within the resistance movement. Bird of Prey (eighth season): Producers Ivan Goff and Ben Roberts acquired the rights to a Victor Canning novel as the basis of this two-part episode. A case takes Mannix to another country. He becomes aware of a plot to kill the nation’s leader. In Part II, the plot succeeds and Mannix is framed as the assassin. The detective now is on the run, trying to clear his name and bring the conspirators to justice. The two-part story also marks composer Lalo Schifrin’s final original score for the series. Aug. 15 is the 90th birthday of actor Mike Connors, a familiar face to American audiences. His spy entertainment credentials include Kiss the Girls and Make Them Die, a 1966 film that rode the spy craze of the decade. Today, that movie is a bit of a curiosity item, particularly how it bears a remarkable resemblance to the 1979 007 film Moonraker (except for its budget). The main item of Connors’ acting resume is the 1967-75 detective series Mannix. The lead character, Joe Mannix, seemed to absorb a considerable amount of punishment in solving his cases. Mannix dabbled occasionally in espionage, including a second-season episode where there was a spy played by Hugh Beaumont. The series also had a two-part episode in its seventh season, where Mannix gets recruited by the U.S. government to help out the rebel leader of a South American country. In the final season, there’s another two-part story where Mannix gets involved in international intrigue outside the U.S. That two parter was based on the Victor Canning novel Venetian Bird. It also had the last score for the series by Lalo Schifrin, who penned the show’s theme music. Connors was already 42 when Mannix first aired. He had been a basketball player at UCLA and was still athletic enough to make a convincing action hero. During the filming of the pilot, he was injured while dodging a helicopter, a scene that would be used in the main titles of the series.